As we know that, a pointer is used to store the address of a variable in C. Pointer reduces the access time of a variable. However, In C, we can also define a pointer to store the address of another pointer. Such pointer is known as a double pointer (pointer to pointer). The first pointer is used to store the address of a variable whereas the second pointer is used to store the address of the first pointer. Let's understand it by the diagram given below. The syntax of declaring a double pointer is given below. int **p; // pointer to a pointer which is pointing to an integer. As you can see in the above figure, p2 contains the address of p (fff2), and p contains the address of number variable (fff4). Q. What will be the output of the following program? In the above question, the pointer arithmetic is used with the double pointer. An array of 6 elements is defined which is pointed by an array of pointer p. The pointer array p is pointed by a double pointer pp. However, the above image gives you a brief idea about how the memory is being allocated to the array a and the pointer array p. The elements of p are the pointers that are pointing to every element of the array a. Since we know that the array name contains the base address of the array hence, it will work as a pointer and can the value can be traversed by using *(a), *(a+1), etc. As shown in the image, a can be accessed in the following ways. *(a): since a store the address of the first element of the array, we can access its value by using indirection pointer on it. *p: if a is to be accessed by using a pointer p to it, then we can use indirection operator (*) on the first element of the pointer array p, i.e., *p.
**(pp): as pp stores the base address of the pointer array, *pp will give the value of the first element of the pointer array that is the address of the first element of the integer array. **p will give the actual value of the first element of the integer array. Coming to the program, Line 1 and 2 declare the integer and pointer array relatively. Line 3 initializes the double pointer to the pointer array p. As shown in the image, if the address of the array starts from 200 and the size of the integer is 2, then the pointer array will contain the values as 200, 202, 204, 206, 208, 210. 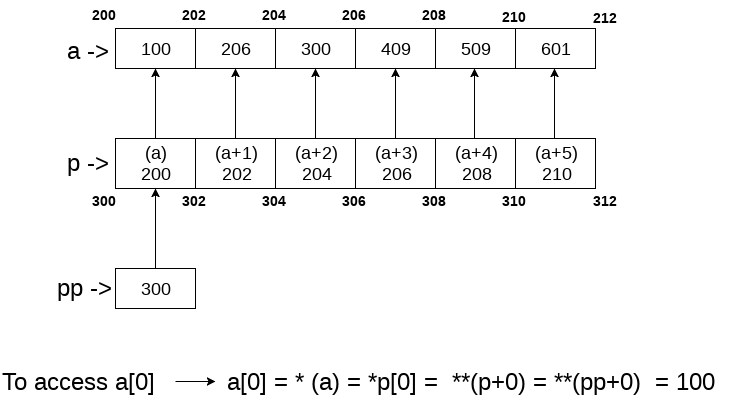 Let us consider that the base address of the pointer array is 300; the double pointer pp contains the address of pointer array, i.e., 300. Line number 4 increases the value of pp by 1, i.e., pp will now point to address 302. Line number 5 contains an expression which prints three values, i.e., pp - p, *pp - a, **pp. Let's calculate them each one of them. pp = 302, p = 300 => pp-p = (302-300)/2 => pp-p = 1, i.e., 1 will be printed. pp = 302, *pp = 202, a = 200 => *pp - a = 202 - 200 = 2/2 = 1, i.e., 1 will be printed. pp = 302, *pp = 202, *(*pp) = 206, i.e., 206 will be printed. Therefore as the result of line 5, The output 1, 1, 206 will be printed on the console. On line 6, *pp++ is written. Here, we must notice that two unary operators * and ++ will have the same precedence. Therefore, by the rule of associativity, it will be evaluated from right to left. Therefore the expression *pp++ can be rewritten as (*(pp++)). Since, pp = 302 which will now become, 304. *pp will give 204. On line 7, again the expression is written which prints three values, i.e., pp-p, *pp-a, *pp. Let's calculate each one of them. pp = 304, p = 300 => pp - p = (304 - 300)/2 => pp-p = 2, i.e., 2 will be printed. pp = 304, *pp = 204, a = 200 => *pp-a = (204 - 200)/2 = 2, i.e., 2 will be printed. pp = 304, *pp = 204, *(*pp) = 300, i.e., 300 will be printed. Therefore, as the result of line 7, The output 2, 2, 300 will be printed on the console. On line 8, ++*pp is written. According to the rule of associativity, this can be rewritten as, (++(*(pp))). Since, pp = 304, *pp = 204, the value of *pp = *(p) = 206 which will now point to a. On line 9, again the expression is written which prints three values, i.e., pp-p, *pp-a, *pp. Let's calculate each one of them. pp = 304, *pp = 206, a = 200 => *pp-a = (206 - 200)/2 = 3, i.e., 3 will be printed. pp = 304, *pp = 206, *(*pp) = 409, i.e., 409 will be printed. Therefore, as the result of line 9, the output 2, 3, 409 will be printed on the console. On line 10, ++**pp is writen. according to the rule of associativity, this can be rewritten as, (++(*(*(pp)))). pp = 304, *pp = 206, **pp = 409, ++**pp => *pp = *pp + 1 = 410. In other words, a = 410. On line 11, again the expression is written which prints three values, i.e., pp-p, *pp-a, *pp. Let's calculate each one of them. On line 8, **pp = 410. Therefore as the result of line 9, the output 2, 3, 410 will be printed on the console.